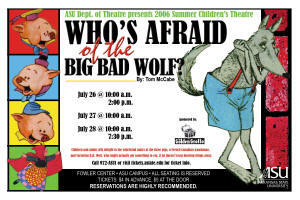 The Arkansas State University Theatre will continue its 2006 ASU Summer Children’s Theatre season with “Who’s Afraid of the Big Bad Wolf?” by Tom McCabe. Come and follow Cornelius B.B. Wolf as he sets out to capture his dinner. The Three Little Pigs and Little Red Riding Hood might need the audience’s help to escape the wolf’s appetite as a French Canadian woodsman works hard to keep the Big Bad Wolf on his toes. This hilarious comedy combines the whirlwind antics of three pigs, an eager woodsman and Cornelius B.B. Wolf, who might actually get something to eat, if he doesn’t keep blowing things away. This clever fairy tale combination will keep the entire family laughing into the aisles. Under the stage direction of Molly Simpson, professor of theatre; the cast for the season opening production includes Kyle Hamsher from Jacksonville, a senior theatre major, as Cornelius B.B. Wolf; William Rowland from Jacksonville, a senior theatre major, as Piedmont Pierre; Whitney Elliot from Magnolia, a sophomore theatre major, as Porky; Katy Saul from DeValls Bluff, a sophomore theatre major, as Oinker; Haley Rose Grisham from Jacksonville, sophomore, as Bacon Bits; Stacy Olm from North Little Rock, a graduate student of theatre, as Little Red Riding Hood; and Misty Clark from Jonesboro, a ASU theatre graduate, as Mrs. Hood/Grandma Hood. The production design team includes Kelly Schaefer, assistant professor of theatre, costume and makeup design; Jeff McLaughlin, assistant professor of theatre, scenic design and technical direction; and lighting design by Ashlee Wiseman from Searcy, a senior theatre major. Brandon Doty from Jonesboro, a senior theatre major, will serve as stage manager. Performance dates are Wednesday, July 26, at 10 a.m. and 2 p.m.; Thursday, July 27, at 10 a.m.; and Friday, July 28, at 10 a.m. and 7:30 p.m. 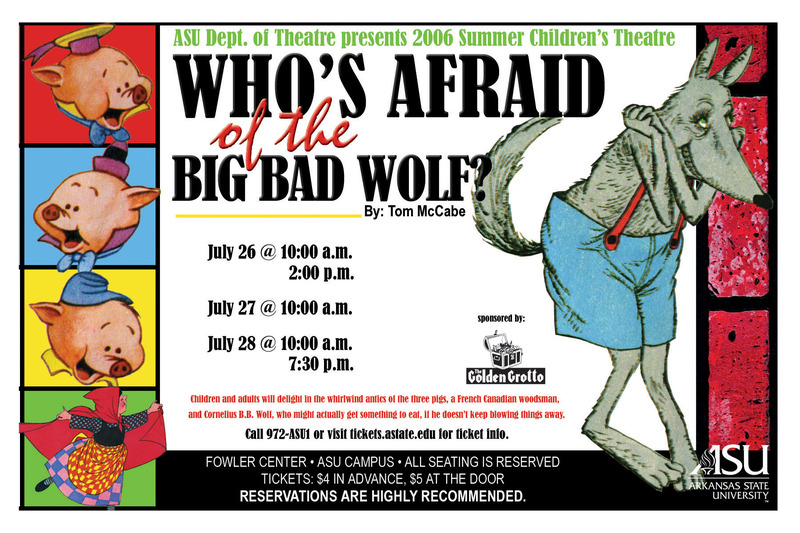 This production of “Who’s Afraid of the Big Bad Wolf” is sponsored by The Golden Grotto. All performances will be held at Fowler Center, 201 Olympic Drive, on the ASU campus. All seating is reserved. Tickets should be purchased in advance at the ASU Central Box Office in the Convocation Center for $4 or by calling 972-ASU1, or online at www.https://tickets.astate.edu. Tickets may also be purchased at the door (if available) on the day of the performance for $5. Reservations are highly recommended.